William IV, born August 21, 1765, was the third son of George III and Sophia.At the age of 13, William became a midshipman and began a career in the Royal Navy. 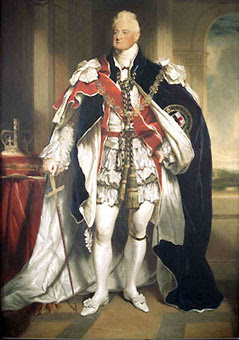 In 1789, he was made Duke of Clarence. He retired from the Navy in 1790. 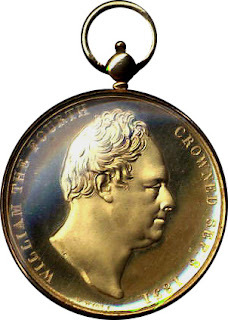 William succeeded his brother, George IV.On the 28th of June 1830 the death of King George IV placed him on the throne.He ascended the thrones of Great Britain, Ireland, and Hanover as King William IV on 26 June 1830, and was crowned on 8 September 1831. In 1833 the Assay Master of the Calcutta Mint, James Prinsep, prepared and submitted to the Governor General in Council, Lord William Cavendish Bentinck who retired in March 1835, a project for reforming the weights and measures of the coins of British India. This was adopted in November 1833. The Governor General Sir Charles Metcalf passed the Act XVII on August 17, 1835. The William two and one mohurs were struck for currency at the Calcutta Mint during 1835/6. Two mohurs: Comes in both grained and plain edge. Size: 32.5mm. Weight: 23.32 grams. Issued date: 1835. One mohur: Comes in both grained and plain edge. Size: 26mm. Weight: 11.66 grams. Issued date: 1835. (Comes with RS and F incuse). One rupee: Grained edge. Size: 30.5/30.7 mm. Weight: 11.66 grams. Issue date: 1835. Comes with RS, F incuse, F raised and no incuse. Half rupee: Grained edge. Size: 24.6/24.9 mm. Weight: 5.83 grams. Issue date: 1835. Comes with RS, F incuse, F raised and no incuse. Quarter rupee: Grained edge. Size: 19.4/20 mm. Weight: 2.91 grams. Issue date: 1840. (Types: Continuous and divided legends). . Comes with RS, F incuse, F raised and no incuse. Half anna: Plain edge. Size 29.5/31.2mm. Weight: 12.95 grams. Issue date : 1835 (Note: Obverse Coat of Arms of East India Company). Quarter anna: Plain edge: Size: 25.3/26.2 mm. Weight: 6.47 grams. Issue date: 1835. 1/12th anna: Plain edge: Size: 17.5/17.9 mm. Weight: 2.16 grams. Issue date: 1835. William died a month after his niece, Victoria, had come of age, thus avoiding another regency. William silver coins were withdrawn from circulation in 1896. Half anna was withdrawn in 1964 while half pice and 1/12th anna were withdrawn in 1959.
thanx for proving ample of fundamental information to coin collectors. i highly applause dis initiative of urs. Sir, It will be ideal if you can also give market price and availability. I have British India coins for exchange. Can provide Silver Re. 1/- of William, Victoria, Edward, George V & George VI - many varities in exchange. Hi.this is santosh.i want to buy william coins.silver.let me know your price. Mistake does not only teach you how to be strong but also how to stand up again and to do good next time. Visit my site for more information. Have a good day always and thank you for sharing your knowledge and wonderful article to the public. I do hope that you can inspire more readers. i have quarter anna coin of 1935.